Retro 1970s and 1980s trick or treat goody bags. Trick or Treating was truly the highlight of Halloween for this chubby kid. I've wanted to blog about these Halloween Trick or Treat goody bags every October and thanks to RetroJunk.com I finally have an image! The best house you could ever visit while trick or treating in the 1970s or 1980s, was the house that gave out goody bags. 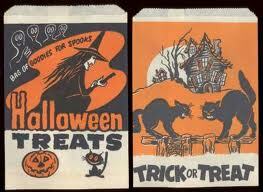 If you were a kid in the 1980s you may recall these white paper bags featured scary black and orange Halloween themed graphics. Generous neighbors would fill the bags with different fun sized chocolate bars and other treats. The only thing that topped these awesome goody bags were the rare homeowners who doled out FULL SIZED chocolate bars. I haven't gone trick-or-treating in more than 25 years, but I wonder if anyone gives out goody bags or full sized chocolate bars today? My other personal favorite were snack cakes such as Hostess Twinkies or Drakes Devil Dogs. Sadly, Mom typically confiscated any snack cakes or apples (who the heck wants an apple on Halloween anyway unless it's covered in caramel!) She felt these were easy targets for hiding razor blades. had razor blades in them. I remember a rare household that gave out fun-size bags of Goldfish crackers. We loved that house. It wasn't chocolate, but they were still a coveted treat! HAPPY HALLOWEEN! I have some from the 80's, leftover, that didn't get used up! I have some, from the 80's, that didn't get used up. A friend of mine usually gives out full sized candy bars; but this year, there may not be any trick or treating in her city (at this point postponed), it was pounded by the snowstorm, trees and power lines down, still no power, state of emergency declared. In my neighborhood there was one elderly couple that gave out red and green stripped bags of loose candy. We were allowed to eat it because my parents knew them well. There never was any worry in our neighborhood, everyone knew everyone and it was mostly elderly people who either didn't have grandchildren or rarely saw their grandchildren and gave my sister and I extra candy because we had better manners than some of the few other kids in the neighborhood. B Chica - I bet you're talking about New Jersey. We moved to FL from NJ in February so all of our friends and family are still there. They've been without power since Saturday. It's crazy! those treat bags were my favourite thing about halloween! i couldn't wait to get home and see what was inside! Absolutely, they do, though the goody bags are a little more sophisticated--in colors other than orange and black. And my son got several full-size treats this year.